Fashion Week Men started strong on its first day. 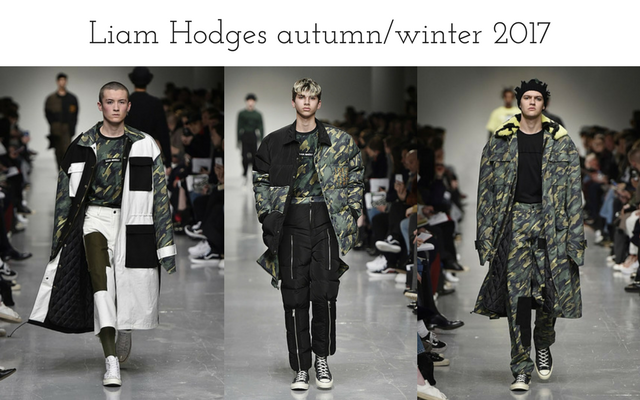 Liam Hodges’ collection was politically charged and extremely relevant to the times. Inspired by one line performance poet Hector Aponysis – “Looking for a vocation in the decline of civilisation” – as well as the likes of A Clockwork Orange and Mad Max, Hodges’ collection, entitled ‘Dystopia Lives’, was dark and deconstructed with a slight upbeat feel, indicating that “darkness can be beat”. The collection featured his signature earthy colour palette with flashes of neon as well as mismatched patchwork, smudged camouflage, distorted prints and embroidered outerwear. Slogans including “Ideology is a myth” made a strong statement in this brilliant AW debut collection. 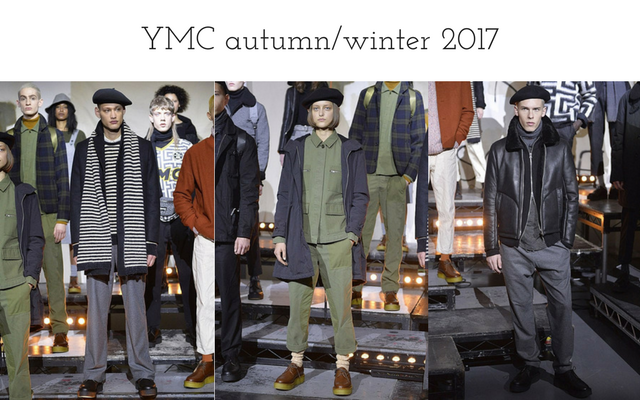 References for YMC’s AW17 collection include the Bauhaus movement and Berlin in the late 1970s and early 1980s. The resulting collection was functional and directional with clean lines but at the same time, each piece was extremely wearable. With a muted palette of neutrals pepped up with a handful of geometric prints, the collection highlights included sheepskin flight jackets, a speckled wool coat and fishtail parkas. Each piece instantly covetable but crucially, it would fit in seamlessly into any wardrobe. I’m coveting all of the womenswear pieces shown in the presentation too! 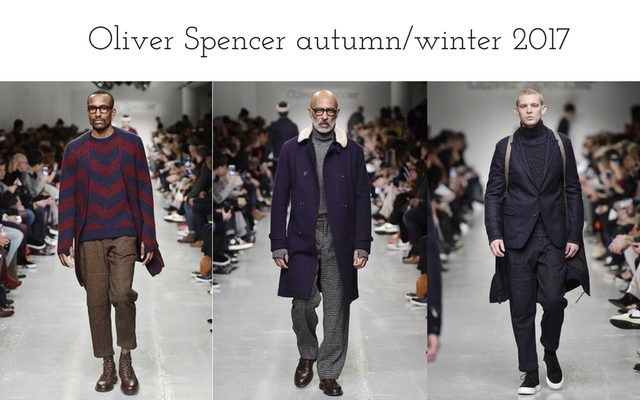 Oliver Spencer’s AW17 collection is timeless in more ways than one. Hats off to whoever put together a fabulous cast of models from all age brackets, bucking the norm of brands showcasing their goods on models who are likely to alienate their core customer. The casting was fitting for a collection which was beautifully timeless and instantly covetable. Featuring layers upon layers and cosy fur-collared overcoats and a rainbow of roll necks, the collection also had flashes of velvet and tartan and stripes. 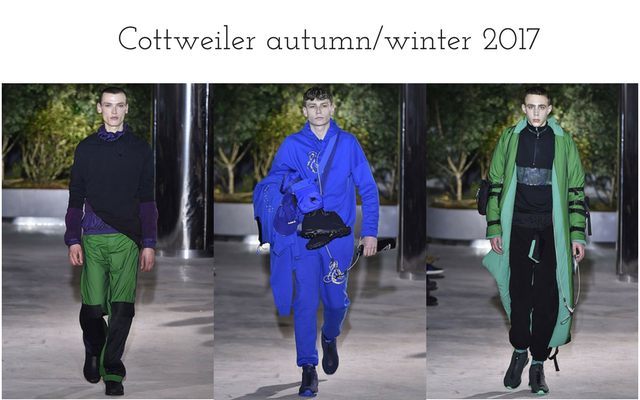 Nature called and Cottweiler’s design duo Ben Cottrell and Matthew Dainty answered. Their AW17 collection is heavily inspired by nature and camping. Models clad in colour-blocked waterproof sportswear stomped down the runway with bags, iphone chargers and sleeping bags strewn across their person. Black and green dominated with a pepper of indigo and lilac. Subtle swan motifs scattered throughout the collection added a softer edge to a great collection which packed a 90s punch. 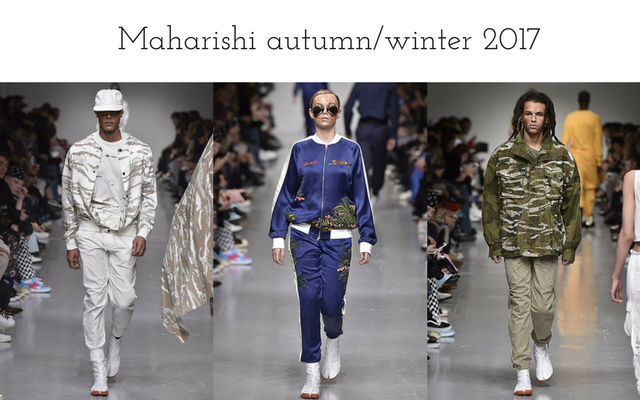 Maharishi and military go together like peanut butter and jelly. I look forward to their new twist on the perennial trend every season. Autumn/Winter 2017 sees the brand travel across to Africa for inspiration. The collection, entitled ‘Tour D’Afrique’, took inspiration from the Chinese and US occupation in different parts of Africa, resulting in an impactful collection with Eastern, Western and African influences. The colour palette, of course, featured khakis and camo as well as a sprinkling of earthy tones and coral. Tiger stripes complemented the camouflage in this great collection.